OhGizmo! 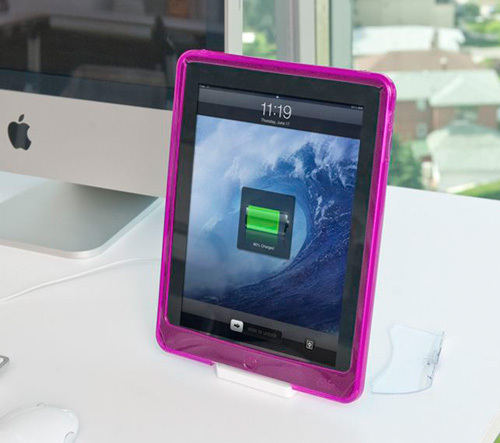 Reviw – iSkin Vu Original iPad Case | OhGizmo! We all know how important protection is for your iPad. There are a multitude of cases on the market that make even looking for a good case a nightmare. The good people at iSkin came out with two cases called the Vu and the Duo. While the Duo hit a home run here at the office, the Vu fell a little short. The reason this was named the Vu is because of the see-through back that has a very lightly raised pattern. This part of the case is entirely comprised of a hard plastic, except for the soft plastic flap on the very bottom that is meant to cover the dock connector. About 85% of the clear backing is almost seamless with the colored plastic, excluding a small area on the bottom that is removable for ease of docking. The soft colored plastic separates these two areas, and covers the rest of the back and comes up over the sides of your iPad. Exposed areas include the screen, ¾ of the left, right, and top black lining around the screen, mic, and speaker. The standby button and headphone jack have flaps to protect them from dust and scratches. The volume and home buttons have plastic that mimic their shape to make them easy to find. This soft plastic can be found in pink, aqua, and dark blue, black, red, orange, and purple, but the hard plastic will always be clear. Now that I’ve explained this case a little bit, there are only a few, but extremely annoying things about this case. The case itself is good for protection, but doesn’t fit snugly around the iPad. This throws off where buttons are supposed to be and makes a lip that your fingers run into around the screen. The soft plastic is soft, but so thick that it makes the flaps almost impossible to get off. I can’t tell you how angry a person can get when something so small such as a flap over a button can be when you’re tired and just want to read an ebook. I’ll fiddle with that stupid thing for a full 30 seconds sometimes. Also, the removable clear portion on the bottom that is supposed to make docking easier is actually a pain. The main reason being that you can get it off for docking no problem, but putting it back on after you’re done is nigh impossible. This piece also doesn’t sit flush with the rest of the case, and my OCD just can’t handle that. Also, iSkin, I love you, but please don’t advertise yourself on the front and back of this case. You had it right with the Duo case where it was only on the back. Though this may be a pretty case, I wouldn’t recommend spending the $65 on this case unless you want to rip your hair out. Go with the Duo as it’s just as nice and one million times better. Actually, I have this for my previous iPad. 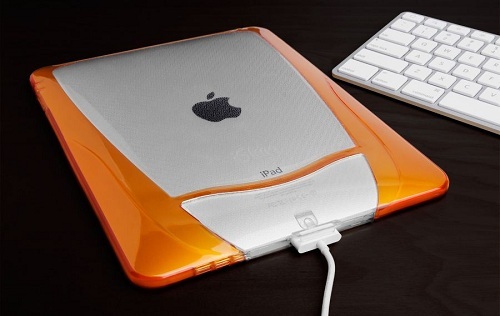 but may I just ask, is there something like this that will fit with the new iPad 2? Since we all know that the iPad 2 is thinner than the previous one.